We have rooms for Private Functions or Small Banquets. Each of our Private rooms includes Wi-Fi Internet Access. We also provide Projector Screen Rentals for $25.00. A podium and PA system is available at no extra charge. Our Private Banquet Room provides a beautiful setting for rehearsal dinners, business meetings, anniversary parties, and more. Mouse over HERE for more info. 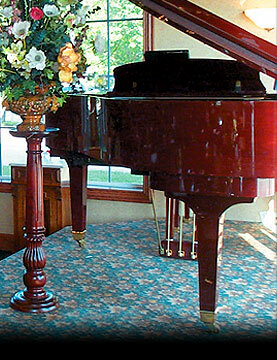 The Piano Room is an elegant site for larger occasions such as wedding receptions, business meetings, and other gatherings. Mouse over HERE for more info.